Hurricane Florence - the most powerful storm to threaten the Carolinas in nearly three decades - is expected to strengthen, say forecasters. 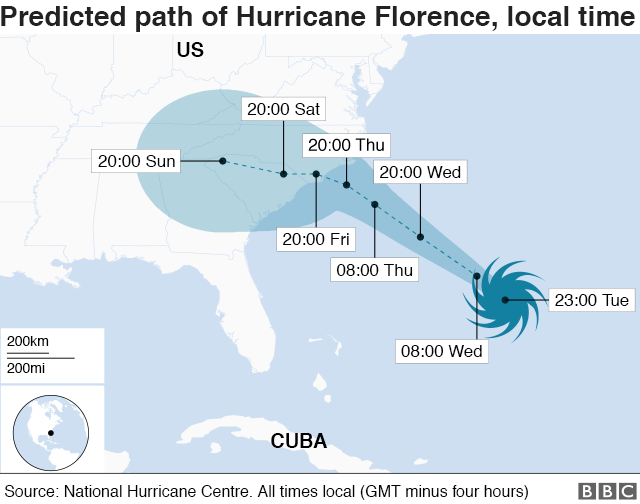 Hurricane Florence was 670 miles (1,078km) south-east of Cape Fear, in North Carolina, as of 23:00 Atlantic Standard Time on Tuesday (03:00 GMT Wednesday), according to the latest National Hurricane Center update. The update says Florence - which is moving north-west at about 17mph (28km/h) - is expected to strengthen on Tuesday night and on Wednesday. "While some weakening is expected on Thursday, Florence is forecast to be an extremely dangerous major hurricane through landfall," it says. What damage could it do? The National Weather Service predicts potential storm surges of up to 13ft (4m) on the coasts along with dangerously large swells and rip currents. Hurricane-force winds will extend outward up to 60 miles from the centre and tropical-storm-force winds up to 175 miles. Rainfall could be up to 25in (64cm) in some areas. This could worsen if, as some meteorologists predict, Florence stalls after it makes landfall. The office of Virginia Governor Ralph Northam predicted "catastrophic inland flooding, high winds and possible widespread power outages". It is also likely to affect the Brunswick Nuclear Plant in Southport, North Carolina, which is just a few miles from where Florence is expected to make landfall. What are people doing to prepare? Mandatory evacuations have been ordered in parts of South Carolina, North Carolina and Virginia, affecting more than a million people. South Carolina's Governor Henry McMaster initially ordered the entire coastline of his state to leave. However, the order was later confined to the northern coast. 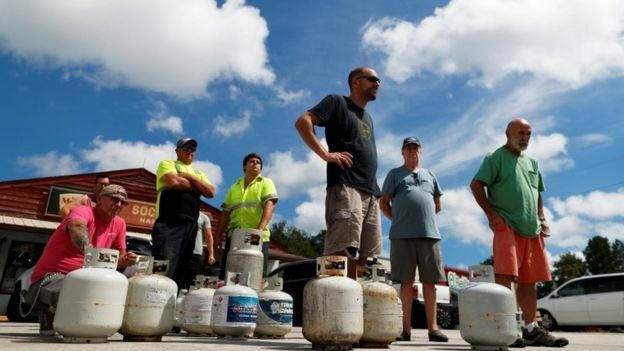 John Johnson, a hardware store manager in Charleston, South Carolina, told AFP news agency there had been a "nonstop" rush on batteries, flashlights, plastic tarpaulins and sandbags. Curtis Oil, a fuel distributor in Chesterfield, South Carolina, said it had been "overwhelmed with requests by state agencies and everybody else". What has President Trump said so far? US President Donald Trump has signed declarations of emergency for both North Carolina and South Carolina, freeing up federal money and resources for the storm response. Speaking in the Oval Office on Tuesday, Mr Trump said the government would spare "no expense" in responding to Hurricane Florence, adding the storm was "tremendously big and tremendously wet". 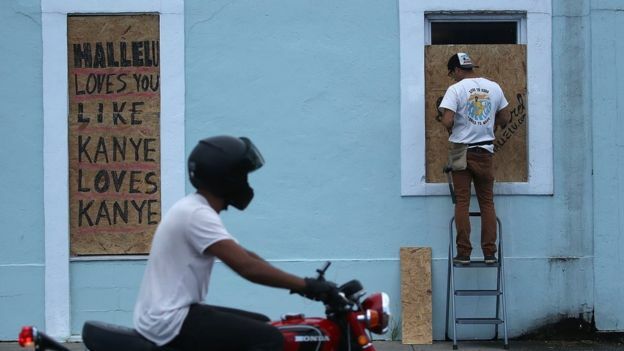 Mr Trump also spoke of the US response to the aftermath of Hurricane Maria in Puerto Rico as "one of the best jobs that has ever been done", describing it as an "incredible, unsung success". The description is in stark contrast to the assessment of Carmen Yulin Cruz, the mayor of the Puerto Rican capital, San Juan, who described Mr Trump's response to the disaster as a "stain on his presidency" after officials revised the death toll last month. The toll now stands at an estimated 2,975 people - nearly 50 times the earlier figure of 64. That number includes those who were killed directly by Hurricane Maria, as well as those who died in the six months following the storm as a result of poor healthcare provision and a lack of electricity and clean water. Why are people worried about flood insurance? The US government has a National Flood Insurance Programme (NFIP) that helps pay for flood coverage in high-risk zones across the country. The programme, which is billions of dollars in debt, has been up for renewal several times - Congress' next deadline to re-authorise the NFIP is 30 November. While some wind damage may be covered by regular homeowners' insurance, flooding is a different story. In the US, flood protection policies from private providers are often very expensive, largely because it is difficult to assess a home's flood risk. These policies also take 30 days to kick in, meaning any homeowners without coverage in the Carolinas now will not be able to insure their property before Florence hits. According to the Insurance Information Institute, 14% of Americans living in the southern states had flood insurance as of 2016. Is Florence the only storm? No. On the opposite side of the country, officials in Hawaii are warning residents and tourists to brace for the arrival of Tropical Storm Olivia. Forecasters say Olivia - with current wind speeds of 65mph - will make landfall on Wednesday morning. Schools and state parks have closed. Ten to 15in (25 to 38 cm) of rain is forecast for Big Island.